Sometimes referred to as Chandler Mall, or Chandler Fashion Mall, this newer mall was completed in 2001 and is the only mall in Chandler. There are about 180 stores in the mall. It has a unique shape (like the letter A) which can make it confusing to navigate. The mall is anchored by Macy's, Sears, Nordstrom and Dillards. Brighton Collectibles, Chico's, Coach, Eddie Bauer, New York & Company, Ann Taylor Loft, Abercombie & Fitch, Disney, Fossil, Lucky Brand, Barnes and Noble, Pottery Barn, Build a Bear and Fuzziwig's Candy. There is also an Apple Store at this mall (park near Nordstrom). In addition to the food court, there is an outdoor area as well as perimeter businesses with some shops (Atomic Comics, Best Buy) and many restaurant choices. BJ's Restaurant & Brewery, P.F. Chang's, Dave's Barbecue, Kona Grill, Cafe Zupas, Firebirds Rocky Mountain Grill, My Big Fat Greek Restaurant, Majerle's Sports Grill, Firebird's Wood Fired Grill, Benihana's, just to name a few. Harkins has a 20 theater movie complex at Chandler Fashion Center. There is a free toddler play area near Barnes and Noble and the elevator, in the center of the mall. Chandler Fashion Center was designed as an indoor/outdoor shopping experience, although most of the stores are indoors. During the summer, there is a splash pad where the kids can enjoy water play. Located right off the Loop 101 Price Freeway at Chandler Blvd., shoppers from Chandler, Gilbert, and south Tempe find this mall very convenient. From the east: Take Loop 202 Santan Freeway westbound and exit at Price Road (NOT Loop 101) Exit 50B. Turn right (north) on Price to Frye Road. Left on Frye. Bear right to enter mall. From the north: Loop 101 Price Freeway to Chandler Blvd, Exit 60. Cross Chandler blvd and bear right to enter mall. Check here to see how long it will take you to drive to Chandler from other points in the area and in the state. There are many more restaurants and stores within about half of a mile of the mall. South, you'll find stores like Bed, Bath and Beyond, Sports Authority, DSW Shoes and Costco as well as eateries like Someburro's and Chompie's. Across Chandler Blvd, restaurants like Abuelo's Mexican Food and a Walmart Neighborhood Market. Within a mile east of the mall, more stores (Ross, Ulta, TJ Maxx, Ski Pro, Nordstrom Rack) and more eating places (NYPD Pizza, Outback Steakhouse, Cheddar's, Mimi's Cafe). Find more activities and attractions in Chandler. Enjoy these photos of Chandler Fashion Center in the Shopping Mall photo gallery. Stores and restaurants open and close, as do mall programs and other features. 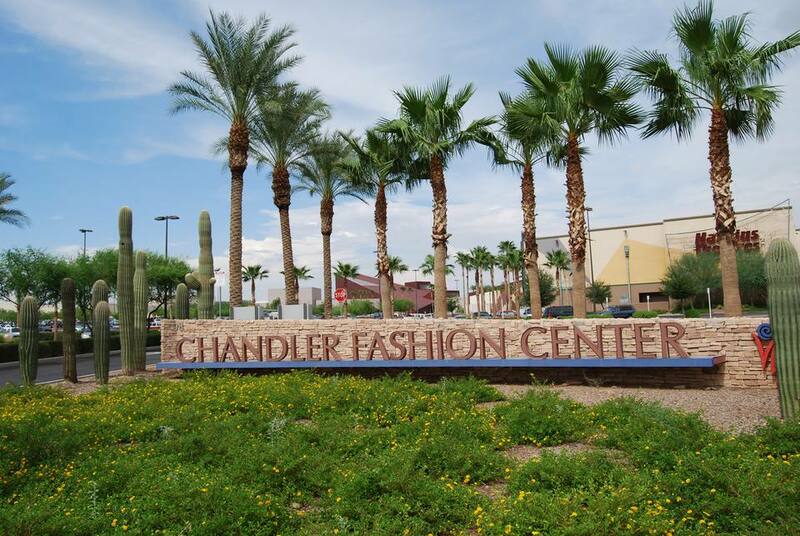 With specific questions about the mall, visit Chandler Fashion Center online or call them at 480-812-8488. What's Better than Beer and BBQ? A Festival with Beer and BBQ!